Happy Friday everyone! I hope you all have fun plans for the holiday weekend - preferably ones that include lots of peanut butter eggs, marshmallow peeps and chocolate bunnies. We have two egg hunts planned and I'm so excited to hunt with Mac this year, now that he's old enough to actually get it. And I'm even more excited to steal the candy out of his eggs and eat it myself. Does that make me a terrible mom? Don't answer that. 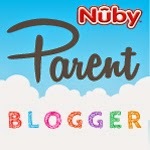 Anyway, I am thrilled to announce that I'm now part of the official Nuby Parent Blogger Program. 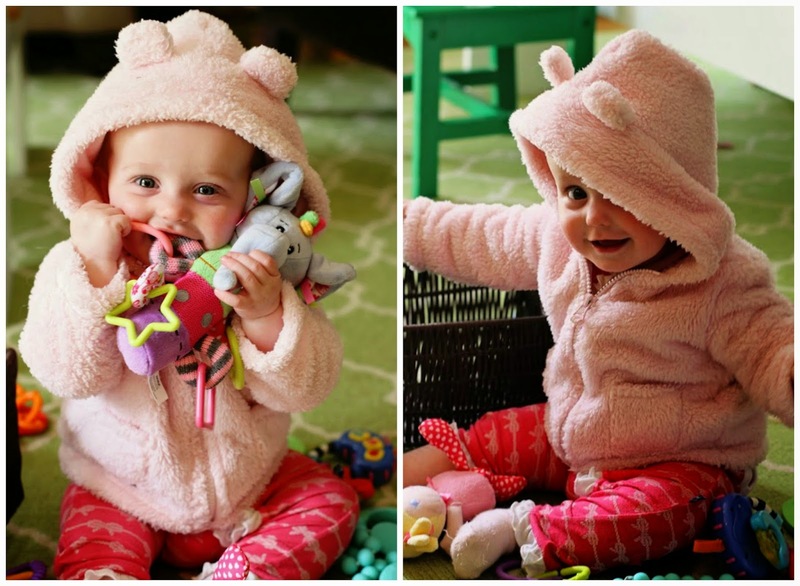 Nuby has been one of my favorite baby brands since Mac was little. We're big fans of their sippy cups and teethers already, so I'm looking forward to trying out some of their other products and letting you know how we like them. 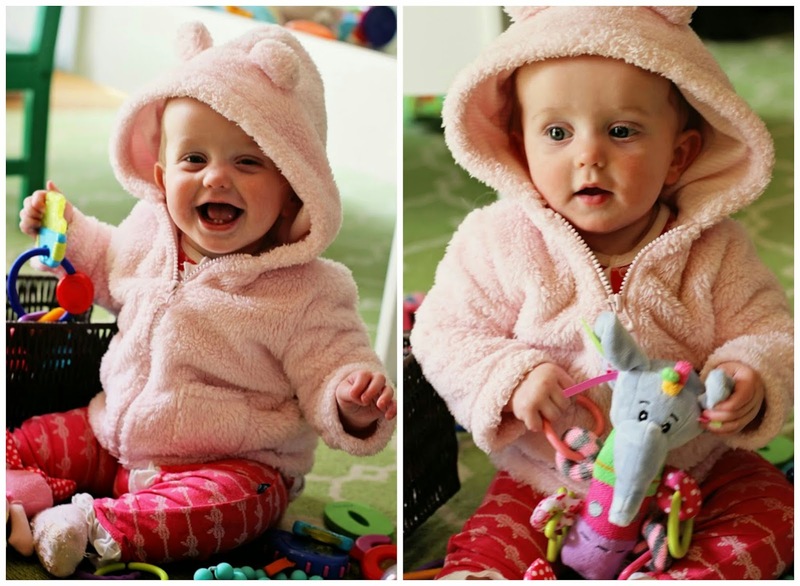 Most of all, Mim is terribly excited because this means she actually gets a few new teethers and toys all of her own - not used chewed-up, drooled-on hand-me-down items from her big brother. Second child problems. The good news for you is that I'll not only be reviewing some Nuby products, but I'll be giving some away too! I can't wait to send you some of our favorite things - we're all about sharing the love these days. If you're in the market for some awesome sippy cups, toys, feeding gear or teethers, you've come to the right place. 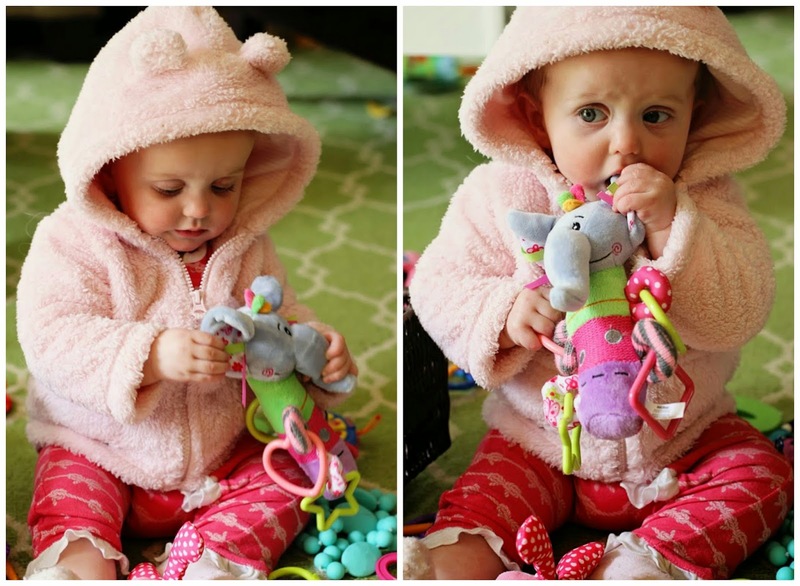 The first product we got to review was this adorable elephant Squeeze N' Squeak plush teether. It's great for any baby 3 months and up. The middle section is plush (with a squeaker) and there are multiple taggies, loops and plastic links on it for teething. It's really easy for babies to hold and super colorful and fun. Anyone else have a teething baby? Or a dog that thinks baby toys are hers? 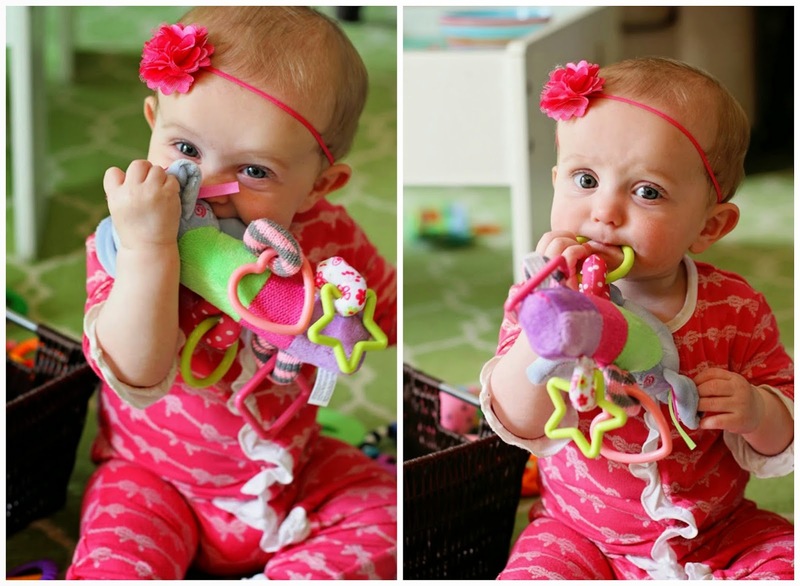 What are your favorite teethers or secrets to getting through those tough teething days/weeks/months? * I received this product free of charge for the purposes of a review, but all opinions, love and drool belong to me and Mim. Ha ha! You are not a terrible mom. I plan on steal candy too. 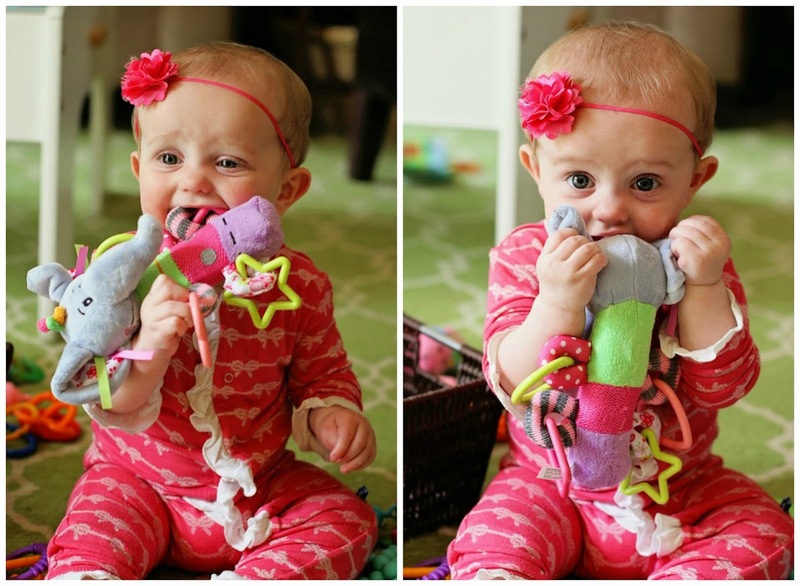 :) Love this teether and how stinking cute Mim looks while enjoying it. Emerson might just need one. I almost bought Reese's eggs for Jude's basket, because he obviously can't eat them and then they would be all mine! 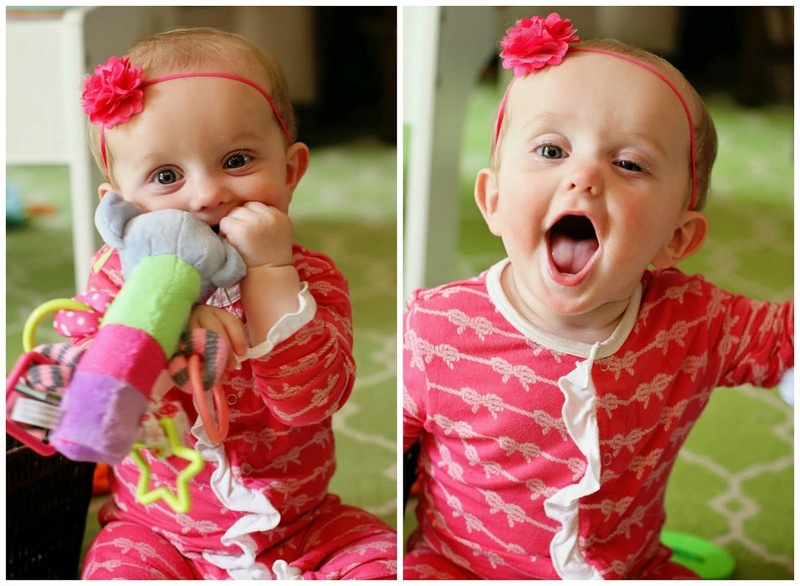 How sweet is she in that little headband! Steal away, mama! I think it's a rule that you have to steal a couple pieces! I just bought Stella a Nuby sippy cup for her Easter basket. Hoping she likes it! 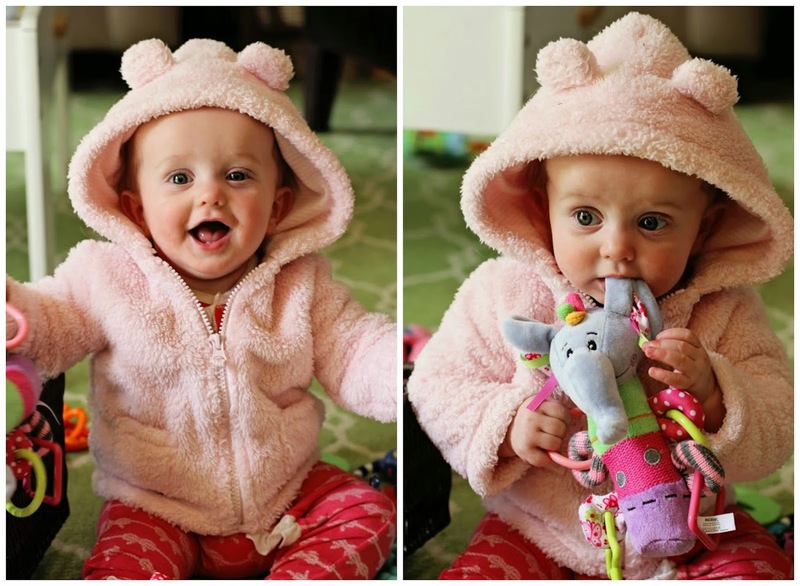 That teether looks great, I may need to get her one of those too! And I've been eating Wyatt's candy since his party yesterday. It's only going to get worse after tomorrow! Hope y'all have a great Easter! awh so exciting! and seriously your little is THE cutest!! I wish I had littles of my own to try out these products! What an awesome opportunity for you and Mim! I'm excited to see which products you like and recommend. I'm sure there will be several that will end up on our home in the very near future. 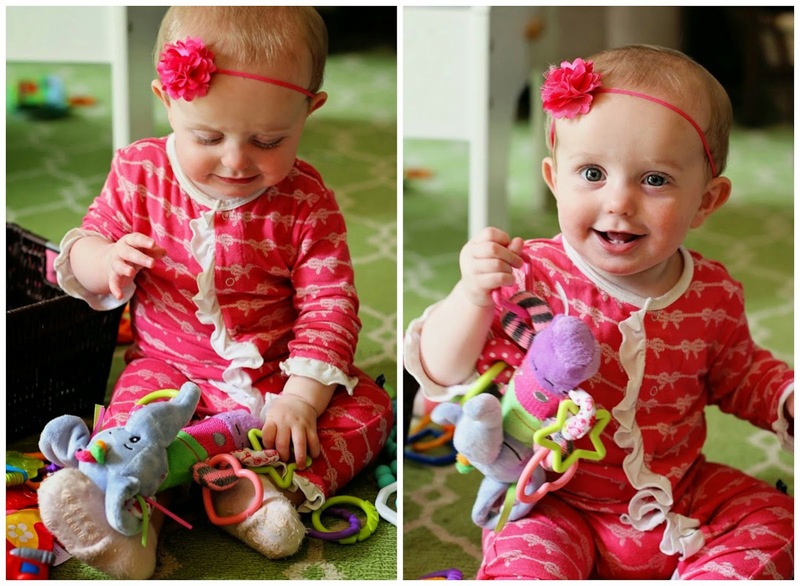 Mim looks like she loves that teether! Looking forward to seeing what else you review! Have a great Easter weekend, and fun on the egg hunts! 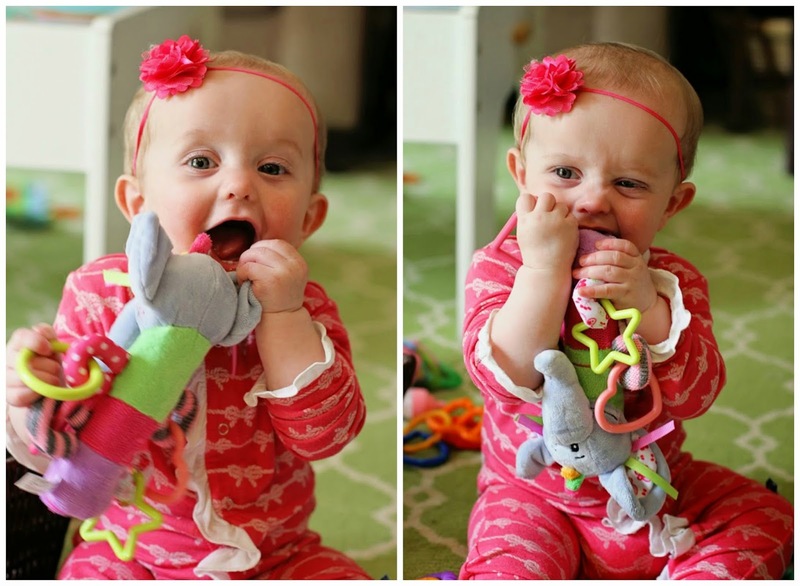 Oh my look at your little girl go to town on her teether! So much fun. My little girl got a Jolly Jumper for Easter and she just loves it. We don't have a dog, but if we did Im sure Id run into the same probs - some of the toys I've seen and plushes do look extremely similar! that elephant is adorable! 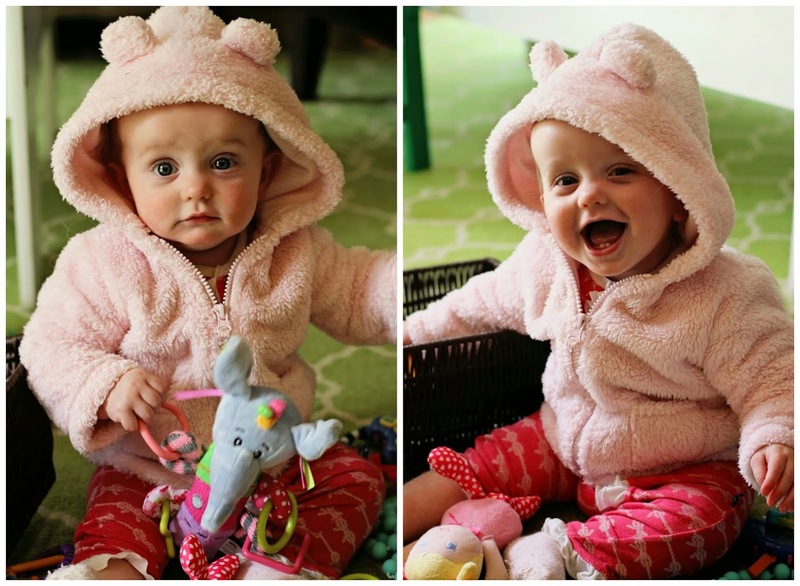 and thanks to you, Nora had a few NUBY items in her Easter basket! Apparently Gigi likes to read your blog as well! ha!